Part of the acclaimed 'Documents of Contemporary Art' series of anthologies . 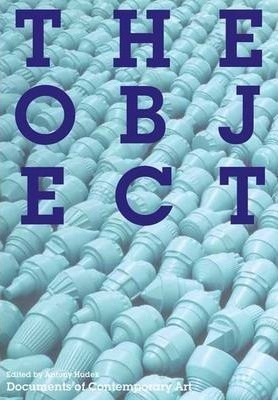 This exciting collection is a pleasure to read from beginning to end...This is a welcome introduction to, and provocative rethinking of the object, in all its many formal and theoretical formations. - Jo Applin, author of Eccentric Objects: Rethinking Sculpture in 1960s America (2012). The object is this thing that refuses to go away. Virtual reality, conceptual art and numerous philosophical and psychological traditions have sought to de-thingify the world, but the object, in its many forms, persists. This anthology surveys reappraisals of what constitutes the `objectness' of production, with art as its focus. Among the topics it examines are the relation of the object to subjectivity; distinctions between objects and `things'; the significance of the object's transition from inert mass to tool or artefact; and the meanings of the everyday in the found object, repetition in the replicated or multiple object, loss in the absent object, and abjection in the formless or degraded object. It also explores artistic positions that are anti-object; theories of the experimental, liminal or mental object; and the role of objects in performance. The object becomes a prism through which to re-read contemporary art and better understand its recent past. Artists surveyed include: Absalon, Art in Ruins, Iain Baxter, Louise Bourgeois, Marcel Broodthaers, Lygia Clark, Claude Closky, Brian D. Collier, Jimmie Durham, Fischli & Weiss, General Idea, Isa Genzken, Gruppe Geflecht, Eva Hesse, Mike Kelley, John Latham, Sherrie Levine, Allan McCollum, Gustav Metzger, Helio Oiticica, Gabriel Orozco, Katrina Palmer, Adrian Piper, Falke Pisano, Issa Samb, Gregor Schneider, Kenneth Snelson, Song Dong, Josef Strau, Alina Szapocznikow, Joelle Tuerlinckx, Eric Watier and Erwin Wurm. Introduction; Subject, object, thing; everyday objects, useful objects; found objects, lost objects, non objects; discursive objects, affective objects; event, object, performance; Biographical Notes; Bibliography; Index; Acknowledgements. This exciting collection is a pleasure to read from beginning to end. Here readers will discover texts that offer a thoughtful interrogation of the possibilities, status and stakes of the object-world we inhabit. Wide-ranging in scope, these writings tackle the psychic, social and physical means by which objects and subjects find, address, impel and produce both themselves and each other, in complex and illuminating ways. This is a welcome introduction to, and provocative rethinking of the object, in all its many formal and theoretical formations - from immaterial concept to obdurate and material 'thing'. - Jo Applin, author of 'Eccentric Objects: Rethinking Sculpture in 1960s America' (Yale University Press, 2012). Antony Hudek is Senior Lecturer at Liverpool School of Art and Design, Liverpool John Moores University. He is a translator of works by Jean-Francois Lyotard, a writer on contemporary art, independent curator and co-publisher of Occasional Papers.